The north-eastern region of India is extremely beautiful but the least explored. If you plan to rediscover the uniqueness of India, you should definitely plan a trip to the northeast which is also referred to as the 'Seven Sisters'. One of the most unique features of this region is the extraordinary diversity – both of people and of landscapes. You'll be surprised to know that the northeastern region of India represents as much as 50% of India's entire biodiversity. The seven states that constitute the northeastern part of India include Arunachal Pradesh, Assam, Manipur, Meghalaya, Mizoram, Nagaland and Tripura. If you are travelling from India, Assam is the point from where you can acess any of the states of the north-east. 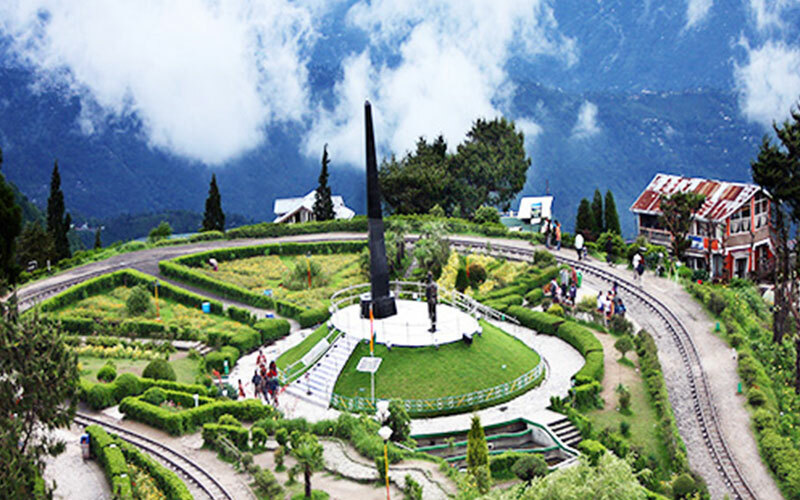 After your arrival at the Bagdogra Airport, head straight for Darjeeling, one of the most visited yet pristine hill stations in the north east. Due to its unparalleled beauty and heart-stirring scenes, Darjeeling is famously known as the 'Queen of Hill Stations'. The 'Darjeeling Tea' is popular and savored all across the world. After a memorable sightseeing tour of Darjeeling, drive to Pelling which is home to a number of Buddhist monasteries, lakes and waterfalls. Next day, leave for Gangtok while visiting the Rumtek Monastery en route. Sightseeing in Gangtok will be a lot of fun and adventure. 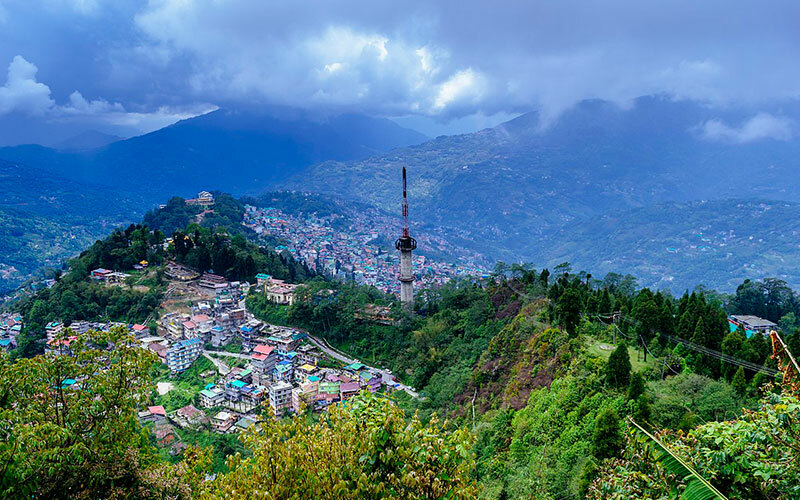 After spending a full day filled with excitement in Gangtok, drive to Kalimpong which is visited for snow-capped mountains, Buddhist monasteries and churches. Explore the numerous attractions and feast your eyes on astounding scenic beauty. Finally, get back to the Bagdogra Airport for your onward journey or flight back home. After breakfast in the beautiful natural surrounding head for the sightseeing of Darjeeling. 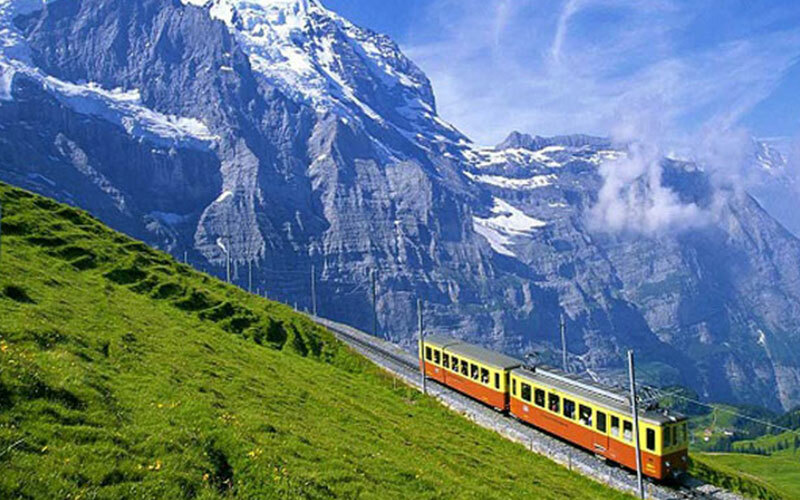 Darjeeling has been called the "Queen of Hill Stations". The natural beautiful surrounding of this hill station is awesome and it can never be bounded in the words. It is a hill station which has the potential to grab attention of all age group people with the interest in any type of tourism. A wide variety of attraction makes Darjeeling hot spot for everyone. Darjeeling is famous for producing world class tea. Visit the Ghoom Buddhist Monastery which is a typical Tibetan Monastery. Your tour to Darjeeling will be incomplete if you escape Ghoom Monastery. Visit some other monasteries near around and proceed for the other magnificent sight of Darjeeling that is Tiger Hill – enjoy the panoramic view of sunrise over the snow capped Kanchenjunga Mountain from this highest point. Also visit Kanchenjunga Himalayan Mountaineering Institute, visit the museum of the institute which houses all the equipments, flora fauna specimen of the Himalayas and many more proves of the attempts made to conquer the Himalayan Peak. Have leisure walk through the green, heart taking and panoramic tea garden. Evening free for own activities .Night stay at your hotel in Darjeeling. After breakfast, in the natural surrounding of Darjeeling enjoy the rising sun and give up your all worries. Further leave for Pemyangtse which is 75 Km and is about 03 Hours drive. Pemyangtse is a small, beautiful and religious center of Buddhism located in the western part of Sikkim. The most famous attraction of the place is Pemyangtse Monastery, which is the second oldest monastery in the state of Sikkim. It is believed that the heaven is depicted at this place. The paintings and sculptures of the monasteries are also the main attraction of this place. 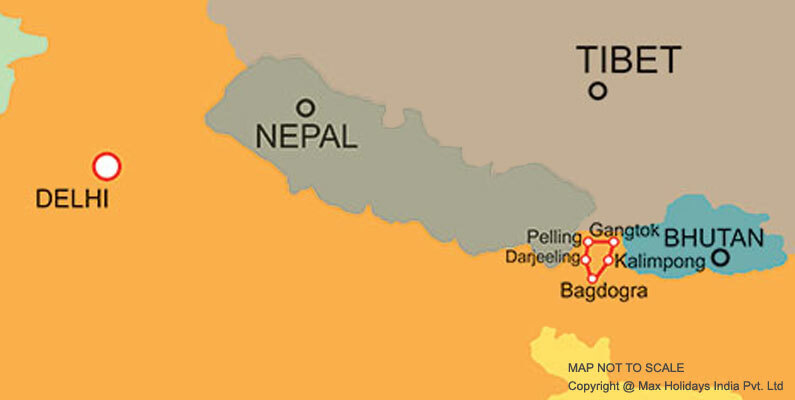 Pelling has the range to please the pilgrim tourists as well as adventure lover. Evening explore the natural beauty of the place and feel the mother nature being in the lap of her. Night stay at your hotel in Pelling. After a leisurely breakfast, take a relaxed and soothing tour of Pelling starting with Sangacholing Monastery – situated in the rich forest cover, you need to take a small walk to reach to this oldest monastery. Rabtense Ruins – at a walking distance from Pemyangtse Monastry this is the place whose ruins holds the history of its past rulers. Khecheopairi Lake - The next for you is the sacred lake of Sikkim, visited admired and adorned not only by Buddhists but also by the Hindus. Kanchenjunga Fall & Rambi Fall – a magnificent and breath taking falls, one should not miss visiting these falls. Evening is free to explore the natural beauty of the place. Overnight stay at the hotel in Pelling. After breakfast leave for Gangtok enroute visiting Rumtek monastery. The ancient Rumtek Monastery is the largest of all among the monasteries of Sikkim. It was built with the purpose of spreading teaching Buddha throughout the world. It was built in1717 A.D. and it was rebuilt again in the year in 1960 by Gyalwa Karmapa, as it cannot survived for a long time when it was first built. The architectural design of Rumtek Monastery has been influenced by the Tibetan Style. Upon arrival in Gangtok, check in the hotel rest of the day free for own activities. Night stay at your hotel. After breakfast, leave for sightseeing of Gangtok which includes Do Drul Chorten is one of the most important Stupa of Sikkim built in 1945 by Trulsshi Rimpoche, head of Nyingma order of Tibetean Buddhism. This stupa has sacred gold Shikhara with 108 prayer wheels. Enchey monastery is another place which is to be visted Enchaney monastery means solitary temple. A religious dance called ‘Chaam’ is performed in the month of January at this monastery. Orchid Sanctuary is the hypnotizing attraction, where tourists get the chance to see the rare and extensive collection of Orchids. It has almost 454 species of orchids found Sikkim. Namgyal Institute of Tibetology (Closed on Sunday) – a center to study and research upon the Buddhist Culture, Flower Exhibition Center – hot spot for now – a- days, as it houses the flowers in boom for almost round the year. If time permits visit the source of water, a placid lake of Sikkim – Tsongo Lake. Evening free for own activities. Night stay at your hotel. Early morning after breakfast drive to Kalimpong which is about 77 Kms and the journey time is about 03 hours. 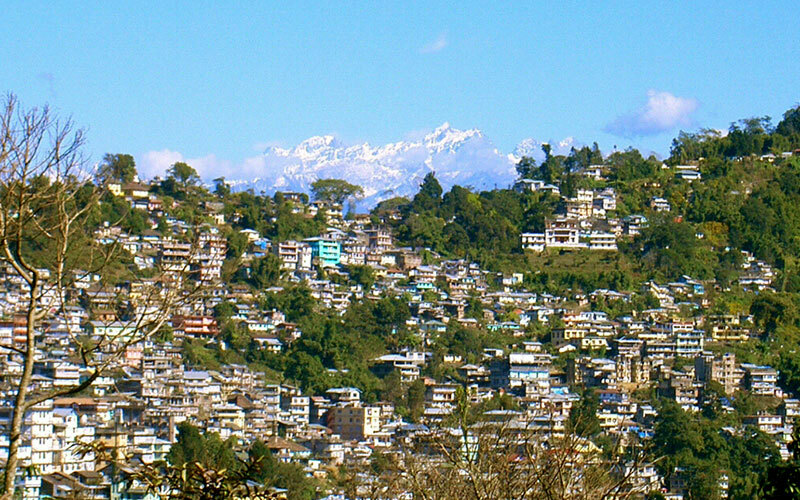 Kalimpong is blessed by calm, lovely and pious ambience due to the presence of snowy mountains, monasteries and churches across the town. It is situated at the foot hills of mighty Himalayas, which add to the natural beauty of Kalimpong. Kalimpong has been in the lime light since the time of Britishers, it use to offer charm to them and relax them from the summer’s of plains. The panoramic view of Himalayas, valleys, meadows, and chilling weather places Kalimpong in the heart of tourists. Enjoy the natural and scenic beauty of the place and admire it sitting in the lap of it. Rest of the day is free for own activities. Night stay at your hotel. Early morning have breakfast with a background of natural canvas placing the view of Himalayas and floating snowy clouds, feel like heaven. Start the sightseeing of this heaven on earth with Durpin Dara - the highest point in Kalimpong which can be reached by car from where you can see the meandering Teesta River and the plains. A beautiful picturesque view of high mountains, plains and flowing and dancing Teesta River can be seen from here. Kalimpong is famous for its Gompas, lets start with the Tharpa Choeling Gompa, Tongsha Gompa is Bhutanese monastery built in 1630 A.D and is the oldest of the region. Zong Dog Palri Fo Brang Gompa is a newly constructed monastery from where one can view the town & surroundings. The next for you is Flower Nursery - which is the producer of 80% of the gladioli and orchid. Dr. Graham's Homes is an educational institution started in 1900 A.D by Dr John Anderson Graham. It is situated at slopes of Kalimpong's highest hill Dealo. Visit the two religious spot of Kalimpong that is Kali Bari and Mangal Dham. Also visit Kalimpong Market where you can see the villagers in their local costumes selling their farm products.